Pony: At it’s adult fully matured height a pony stands under 14.2 hands. Donkey (Equus asinus): A long eared cousin of the horse. Although the care for donkeys can be similar some differences make these guys a different species. A horse has 64 chromosomes while donkeys only have 62. They also exhibit some anatomical differences. Mule: The result of breeding a male donkey with a female horse. Mules are sterile because horses and donkeys both contain different numbers of chromosomes. Hinny: The result of breeding a male horse with a female donkey. Like the mule, a hinny is sterile because horses and donkeys both contain different numbers of chromosomes. Stallion: Stallions are intact, un-castrated male horses. Although much of their behavior lies in their training and upbringing stallions in general tend to be more aggressive and are very territorial. Because of this aggression it is rare that you will find a stallion on an average lesson barn. In the wild many wild stallions will not hesitate to attack and kill a foal he hasn’t sired. 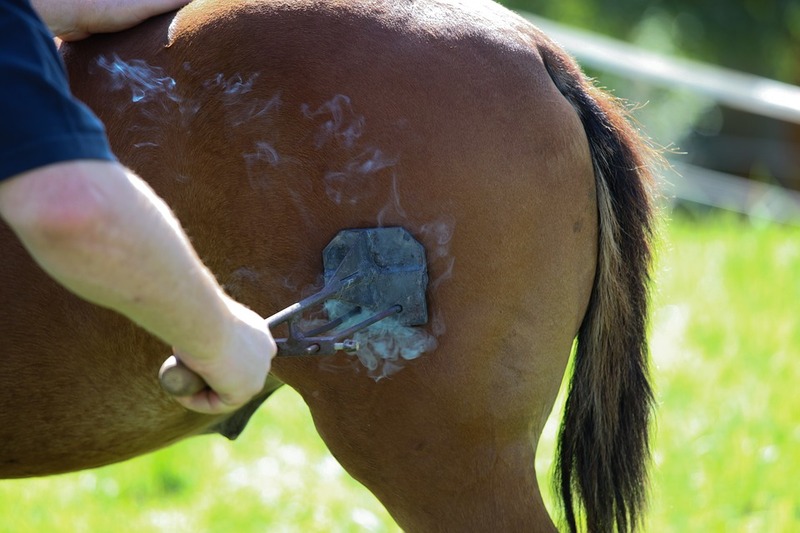 Gelding: Most male horses you’ll meet will be geldings, who have been castrated. Testosterone is produced in the testicles so geldings tend to be much more docile and easier to handle. Mare: A female horse is known as a mare. Because the procedure would be too invasive mares are never sterilized. Hands: A strange term for most. A hand is defined as four inches, roughly the width of the average male hand. This type of measurement has it’s roots in biblical periods and ancient Egypt, but was officially declared to be 4″ in the mid 1500s by King Henry VIII. When we use the unit for measuring horses we notate the number of hands, place a decimal, then add the number of inches. For example, Blade stands 16.1 hands. Therefore he stands 16 hands (64 inches) plus one inch –> Total height is 65 inches. Conformation: People often talk about conformation when describing a horse’s body. It’s a great concern when buying a horse and discussing physical abilities and limitations. The conformation refers to how the horse is built. We examine the straightness of the horse’s legs, the levelness off it’s back, it’s weight and muscular distribution. It also goes into the ratios of leg length, pastern angles, and much deeper. Not all conformational flaws signal future issues or limitations, but it is certainly something to check and be aware of in your own horse. Blade unfortunately has a number of conformational issues that has significantly hindered his ability to perform. As he ages it will lead to arthritis. Lame: Saying that a horse is “lame” doesn’t mean it’s uncool. “Lame” is a general word we use when a horse limps due to pain in a leg or hoof. Horses go lame from a number of reasons: breaks, sprains, or torn ligaments can often be the case. Founder, laminitis, or hoof abscesses can be some other issues. It is often best for your vet to examine the situation to provide the right diagnosis and treatment. Colic: As with “lame” colic is a general term used to indicate abdominal pain and it can be quite deadly. Horses can colic from a variety of things; impactions, gas, sand, poisonous plants, parasites or even eating right after hard work. Horses aren’t physically able to vomit, their digestive tracts go one way. Colic can also be a symptom of another larger issue (like ulcers/colonitis). A few common signs of colic include pawing at the ground, looking at or biting at the sides, trying to roll, or an elevated pulse. Many horses die from colic every year so if this is suspected it’s best to call the vet as soon as possible. Hard-keeper: Ever have that friend that could eat anything and still be skinny? That’s a hard-keeper. In the horse world we don’t like to see ribs and bones. A hard keeper has a high metabolism and requires more fuel to keep a good body condition. Easy-keeper: If you’re like me yo can think or look at something sweet and gain five pounds. Horses like this that are “fat on air” are considered to be easy keepers and tend to be more desirable. They are extremely cheap to feed; your worries with this type of horse are founder, laminitis, or insulin resistance. Green-broke: A green broke horse is one with some training but still needs some more miles. It may be imbalanced or doesn’t yet know all the cues. These horses need a confident balanced rider to help them grow into excellent riding horses. This is the idea behind “The Green Horseman” since I am no seasoned expert riding at Burghley, FEI, or any prestigious competitions. I’ve learned a lot over the years and I am always getting new ideas and insights. As horsemen we all should strive to learn more and I will likely call myself “green” forever because our learning is never finished. Bombproof: Many of us try to get our horses to be what we call “bombproof.” A bombproof can stand quietly through gunfire, fireworks, crowds. He can stay level headed over scary bridges, through tight spaces, and around objects that seem unnatural and loud. Horse’s are prey animals so it can be a lengthy tiresome process to desensitize a horse to so many potentially frightening things. Husband Horse: A husband horse takes care of it’s rider. Since most horseman are female many of us find men who are not exactly into horses like we are. They might ride but they aren’t always enthusiastic and they are more passenger than rider. This horse will take care of any non-rider, men, women, and children alike. You often see the husband horse sought after by people who love to ride trails. Gaits are the different speeds that animals move. We rarely use the term in humans but walking, jugging, and running are considered gaits. Horses have several, some specific breeds have many. For simplicity sake lets start with the basics. This horse has just stepped with its hind right and is about to step with her front right. This will be followed by the hind left and then the front left. Trot: A more lively 2-beat gait. At the trot the front right leg moves with the diagonal hind leg (and the other two move together as well). Jog: Similar to the trot but slower and much more smooth. Typically English riders ride a trot and western riders the jog. This mini is trotting. It’s front right and hind left are just making contact with the ground as the front left and hind right are pushing off. Canter: The canter is a 3-beat gait and begins when one hind leg pushes off. The other hind moves with the diagonal forelimb in the next beat and the remaining forelimb follows. This little mustang mare is cantering. She is just pushing off with her hind right while her hind left & front right are working together. Her front left is the next footfall in the stride. Gallop: A gallop is one of the horse’s top speeds. It is a 4-beat gait so all legs move independently and the horse covers ground very quickly. Between strides all four legs are off the ground at once. After finishing a stride at the gallop Blade is temporarily air-born. You can see as his hind right is about to make the next footfall. Help build my next list of terms! What have you heard spoken around the barn and wondered about? “Pacing” a walk that does not have a clear four beat. And the legs move laterally together instead of diagonally. That’s not a good description but ….. “collection” not something that happens in church but involves the horse bringing his hind end under him more are taking more weight behind, and lifting the shoulders .The size of the steps in walk trot and canter are also somewhat shorter and smaller. Great descriptions! 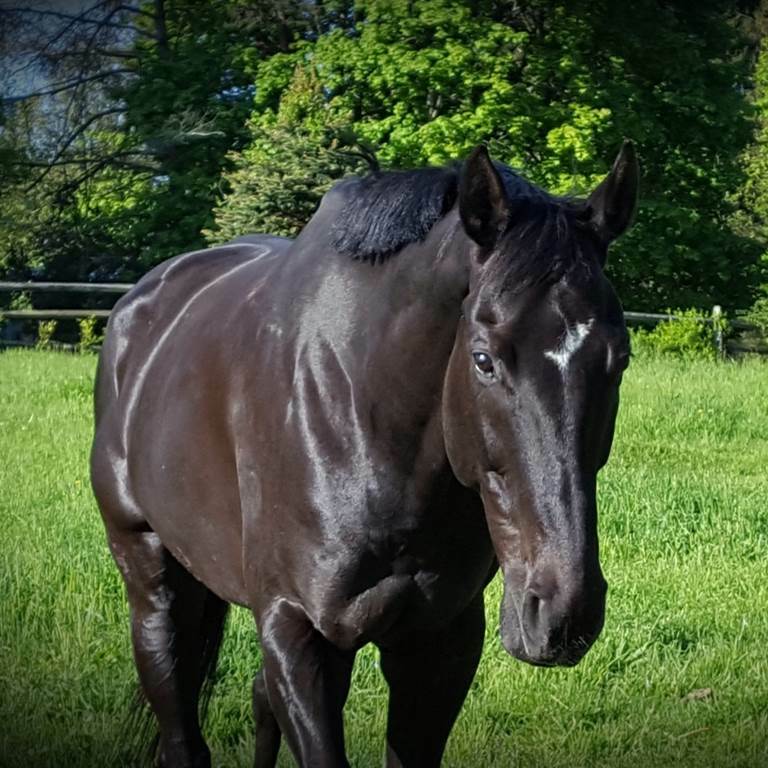 I used to ride a standardbred that paced and we have a few TWHs on our farm. Sorry I forgot to say this is a very good post full of information. Well done! Up on the tippy-toes is how I describe it! !